International Journal of Research in Health Sciences,2017,5,2,11-15. 1PhD Researcher, Bangladesh University of Professionals (BUP), BANGLADESH. 2Assistant professor, Hamdard University Bangladesh (HUB), BANGLADESH. 3Assistant Professor & Head, Department of Health Promotion & Health Education, Bangladesh University of Health Sciences (BUHS), BANGLADESH. A descriptive type of cross sectional study was conducted to assess the prevalence of smoking among selected private university students of Bangladesh with sample size of 396. The students were aged between 18 to 32 years with mean age as 24.42 ± 1.630. Of them 92.2% were male, 52% were in joint family, 72.7% were single and the mean monthly family income was 84833.33 BDT. It was found that 26.3% respondents were studying in MBA, followed by 16.7%, 16.4%, 13.4%, 12.1%, 8.8%, 4.3% and 2.0% were studying in the department of BBA, Textile, CSE, EEE, Law, Pharmacy and others programs like English and MPH respectively. 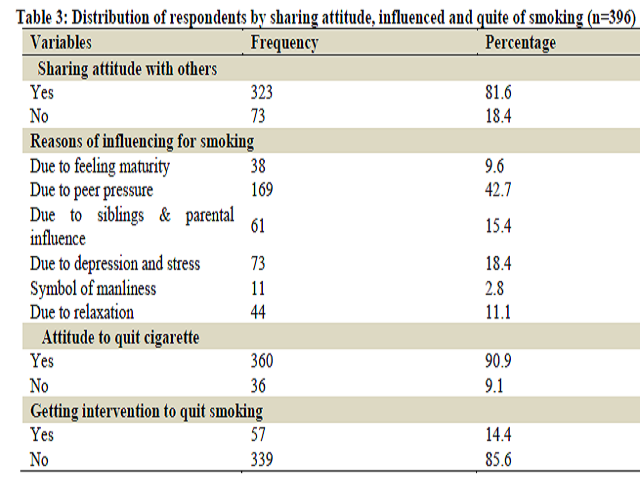 The prevalence of smoking among the respondents was 41.2% and the initiating age was 21-25 (mean± SD=22.62 ± 7.79) years. A little bit more than one-third of the respondents (34.6%) duration of continuous use of smoking were 6-10 (mean± SD=9.67 ± 0.79) years. It is found that 85.6% smoked ≤ 5 (times) cigarette per day with mean frequency per day was 4.87 ± 2.63 times and nearly one third (31.3%) of the respondents were current smoker. Out of all 81.6% shared cigarettes with others like classmates, friends or roommates. It was also found that 42.7% influenced by peer pressure for smoking, followed by 18.4% smoked due to depression and stress, 15.4% for siblings and parental influence, 11.1% for relaxation, 9.6% for feeling maturity and 2.8% smoked for symbol of manliness. It was very remarkable that 90.9% respondents wanted to quit smoking. But it was desponded that only 14.4% received intervention to quit smoking and majority (85.6%) did not get it. The smoking cessation counseling, awareness creation program and warning on health hazards of smoking should be taken by government and proper authority of private universities in Bangladesh.